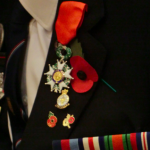 On Thursday 11 November, 16 World War II veterans (15 British and one Australian) were awarded the Légion d’Honneur, France’s highest award, for the role they played in liberating France over 70 years ago. The ceremony took place at the French Ambassador’s Residence in Kensington, in the presence of the French Minister of State for Digital Affairs Axelle Lemaire, the French Ambassador to the United Kingdom Sylvie Bermann, the Australian High Commissioner to the United Kingdom, the Hon Alexander Downer AC and the Rt Hon Earl Howe, Minister of State for the Ministry of Defence and Deputy Leader of the House of Lords. Before the medals were awarded, the veterans’ military achievements – many of them had taken part in the D-Day landings – were read by pupils of the Lycée Français Charles de Gaulle and the Lycée International de Londres Winston Churchill. The veterans were very proud and touched to receive the award in the presence of their family members and many French and British soldiers. This moving event gathered people from 4 generations, as some of the veterans came with their great-grandchildren. The ceremony was followed by the singing of 'God Save the Queen' and 'La Marseillaise'. Axelle Lemaire said how moved and pleased she had been by the ceremony by the opportunity she was given to meet representatives of the last generation of WWII veterans. She pointed out that this event was part of a larger programme launched for the 70th anniversary of the Normandy landings last year, which had already awarded the Légion d'Honneur to more than 1000 British veterans.